Mike Neff returned to Don Schumacher Racing (DSR) in late 2017 after spending 10 seasons working with John Force Racing (JFR) in a variety of positions. His CV includes stints as a crew chief, driver, tuner and overall “brain trust” manager of the entire four-car JFR team of three Funny Car entries and a single Top Fuel dragster. 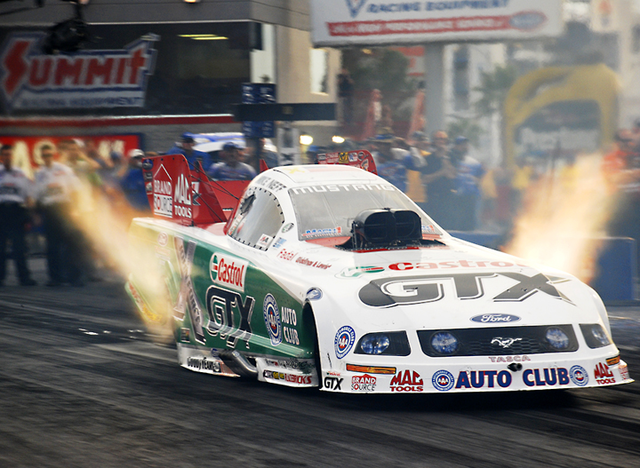 The Californian, who spent seven years at DSR as crewman and crew chief and tuned Gary Scelzi to his 2005 NHRA World Championship in the flopper category – ironically ending John Force’s 12-year reign as Funny Car titleholder – moved to JFR late in the 2007 campaign. Neff made his debut as a driver at the second Las Vegas race that year, earning NHRA’s Auto Club Road to the Future (rookie) award the following season. He returned to the tuning ranks in 2010 and promptly helped John Force win his 15th title before climbing back in the driver’s seat in 2011 when Ashley Force Hood’s pregnancy took her out of competition. Serving as both driver and tuner, Neff earned two consecutive Chevrolet Performance U.S. Nationals victories in NHRA’s biggest race of each year. He climbed out of the driver’s seat – again – to tune Robert Hight and last year returned to tuning John Force. Now “Zippy” has boomeranged back to Don Schumacher Racing and taken on critical duties as crew chief for Tony Schumacher, formerly tuned by Mike Green, who is now off the road but still with DSR. 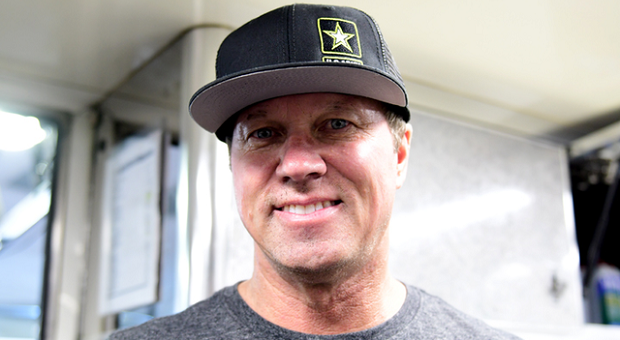 Neff’s assistant on the U.S. Army team is Phil Shuler, who has been with DSR throughout the time that Neff’s been down the street at JFR. 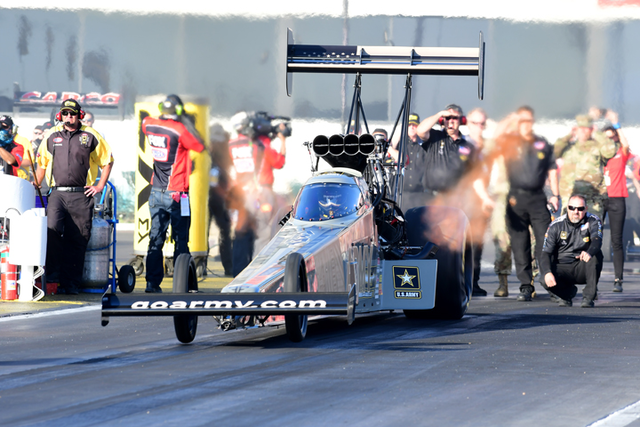 While this isn’t the first time Neff has tuned a Top Fuel car – he worked with Cory MacLenathan before joining DSR – the game is very different these days than it was in the early part of this century. And so is Neff. As the bulk of his experience lies with Funny Car front-engine racecars, Neff has some catching up to do. Learning a new car, made by Don Schumacher Manufacturing (DSM), a new driver and a well-entrenched team doesn’t happen overnight, but Mike Neff made it look fairly easy this past weekend, qualifying eighth in the 14-car field, setting the car’s best qualifying lap in Friday’s second session at 3/732 seconds/331.20 mph. On race day, Neff tuned Schumacher past Terry McMillen and Terry Haddock before he took out teammate Antron Brown in the semi-finals. In the final round contest, Doug Kalitta earned the win while Schumacher and Neff settled for runner-up status and second in points. It was Schumacher’s 65th runner-up result; the eight-time champion has a total of 83 NHRA Wally winner’s trophies. His crew is onboard with their new crew chief, with several members of the team acknowledging that Neff’s cool demeanor is the one thing they like best about their new crew chief. “He never seems to lose it,” was one crew member’s comment. 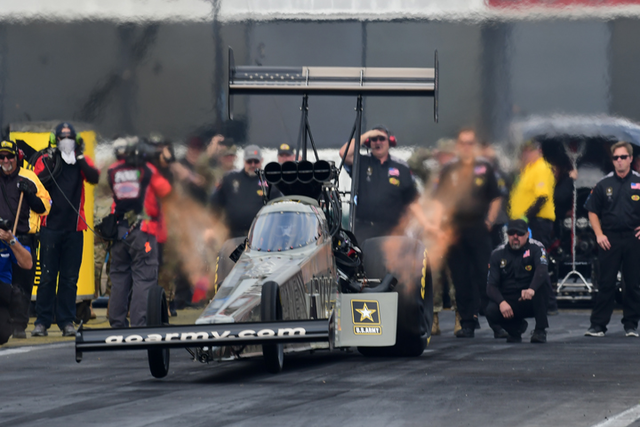 Now Neff, Shuler, Schumacher and the entire DSR U.S. Army team simply have to try again next weekend at Wild Horse Pass Motorsports Park outside Phoenix, site of the second of 24 total NHRA Mello Yello Drag Racing Series contests.